What will the third thing be? It has been the most ridiculous day ever. Went to a meeting with my manager and a developer, felt slight discomfort in my eye, went back to my desk. 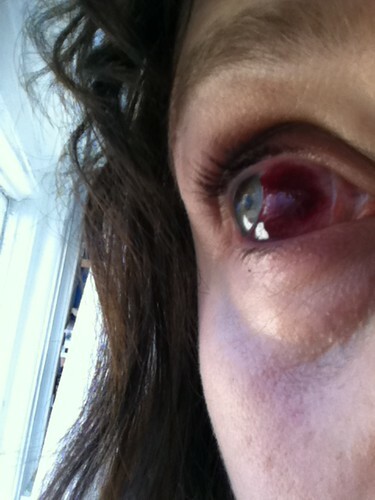 Another colleague asked me a question, I turned to answer her, and she looked aghast - a blood vessel had burst in my eye. Came home, decided to decorate a cake for the White Stuff competition (the Brighton branch is 5 years old and if you win the best cake award, you get £100 worth of vouchers, ie about 2 items of clothing).